A list featuring the best premium WordPress themes for financial companies, financial services, finance related businesses, and consulting companies. The themes selected are easy to install, setup, and customize. They also all have professional and modern designs that will make a great first impression on your visitors. If you want to take your business to the next level and take advantage of digital marketing, then this theme listing is for you. 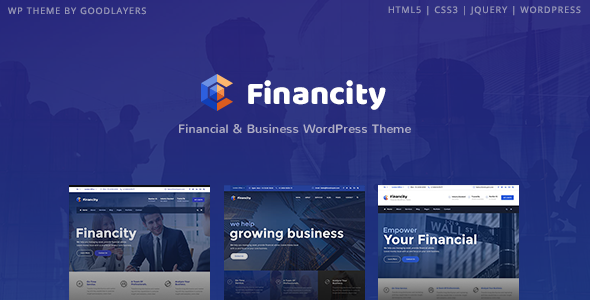 Financity is a beautiful, unique, edgy, and powerful WordPress theme that can serve as a great platform for any financial company, business, or finance related website. Its stunning design and functionality will leave a great first impression to your audience. Financity provides all the necessary features to craft a successful website for your company. It comes with a try before you buy option, impressive pre-made demos, GoodLayers page builder, a use friendly admin panel, live customizer, maintenance and coming soon layouts, unlimited sidebars, and Revolution slider. Try it out today! Financial is a surprisingly amazing WordPress theme. It has the capability of enhancing a website and make it stand out from the crowd. Anyone who chooses to use Financial will benefit from an extensive documentation, clean design, unique demos, premium plugins, an outstanding admin panel, updates for life, social buttons, and shortcode support. Financial will impress you with its level of customization! 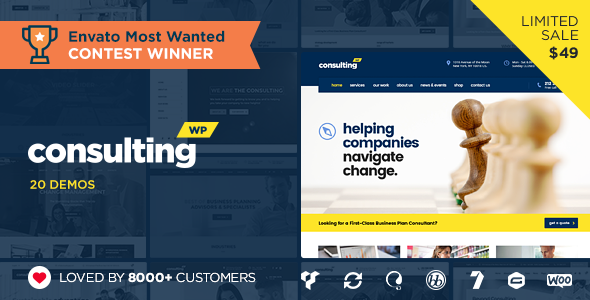 Consulting is a visually pleasing, convenient, user friendly, flexible, professional financial company WordPress theme. This theme is the perfect solution for businesses that are looking to have an engaging and professional design for their website. Consulting is a feature-rich theme skilled in handling the user’s needs. Some of its features include 20 unique demos, 47 templates, different header styles, events manager, Google maps, appointment form, realt-time customizer, and 3 premium plugins. Try Consulting now! 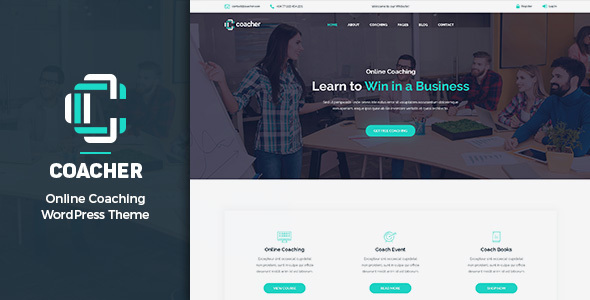 Coacher is a featured packed consulting WordPress theme. The integrated page builder will allow you to create new layouts or edit existing ones. Using Revolution Slide you can highlight your most important content, services, and portfolio. To customize Coacher you can play around with the admin panel and change the colors, fonts, header and footer styles, sidebars, and more. If you have a consulting business offering training or online consultations then purchase out Coacher and you will not regret it. This is one of the best financial company WordPress themes because of its design and functionality. Consulta aims to be a great solution for companies that are looking to expand their business to the online market. This theme’s features are plenty and very easy to use. 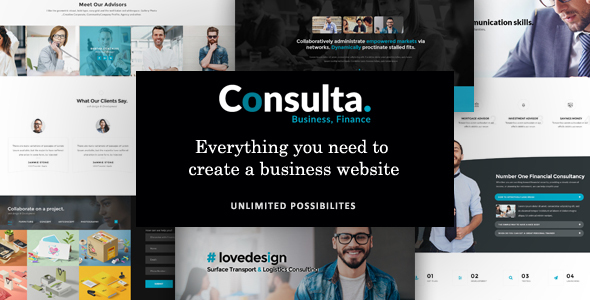 Consulta comes packed with 11 homepage layouts, 2 powerful premium plugins for free, mega menu, 7 header layouts, WPML and WooCommerce compatible, SEO optimized for ranking and speed, and an extensive documentation. Consulta does not require any previous knowledge to use and make the best out of. Go for Consulta! 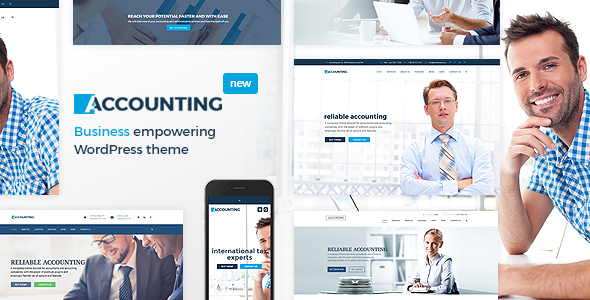 Accounting is a fresh, attractive, professional, adaptable, wonderful, and responsive premium WordPress theme for financial services. This theme is perfect for beginners and advanced WordPress user because it is feature rich and intuitive. With Accounting you get 10 stunning pre-made demos, advanced theme options, Visual Composer drag and drop page builder, easy import option, revolution slider, integrated WooCommerce, full control over colors and fonts, several header layouts, and Google maps. With this high quality theme you can craft a fully operational website in a couple of hours. 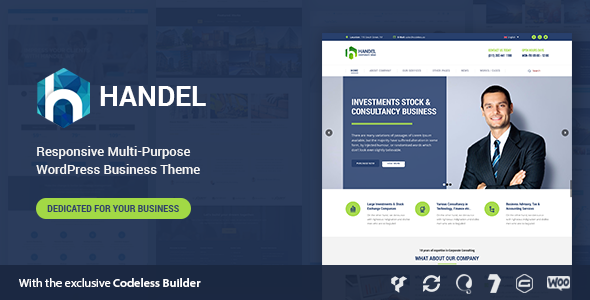 Handel is a powerful, well-designed, feature rich, modern, and polished premium WordPress theme. The developers behind this theme designed and developed it to be capable of ensuring the success of any type of business. It comes with over 200 page design elements, beautiful pre-built page layouts, various header styles, a codeless builder, live customizer, inline text edit, in-page portfolio changes, integrated with a few premium plugins, unlimited blog styles, and optimized code. Handel is a great choice! 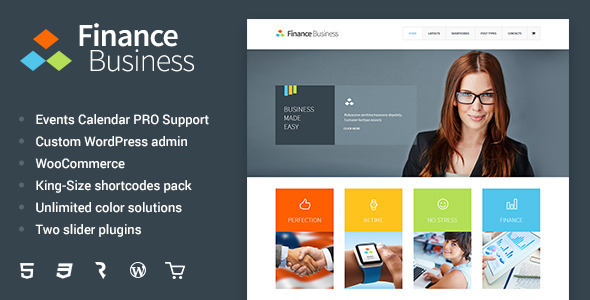 Finance business is a premium WordPress theme with a lot to offer. Its design is simple yet modern and will elevate the overall look and feel of your website. Finance business is a great theme for both novice and professionals and it includes all the features a theme like this should have. The installation of Finance business takes only a couple of minutes and then you can play with its features to develop something beautiful and true to your style. Finance business is the ideal solution for those who do not want to invest too much money and time but still have a professional website. 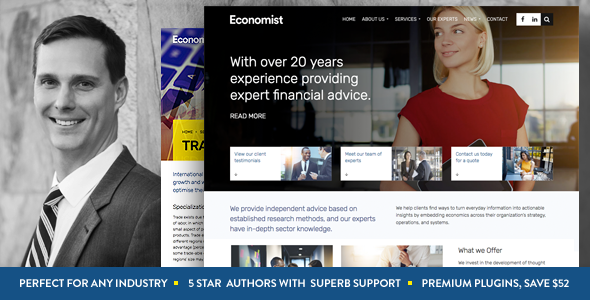 Economist is a premium WordPress theme for financial companies and services that are looking for success. The theme’s installation and setup process is extremely easy and its flexibility and beautiful design allows you to convert views into sales. There is no such thing as too many features when it comes to themes. Economist includes page templates with real content, Visual Composer, SEO optimization, highly customizable admin panel, Layer Slider, a detailed video documentation, RTL support, and many more options. Take advantage of Economist today! 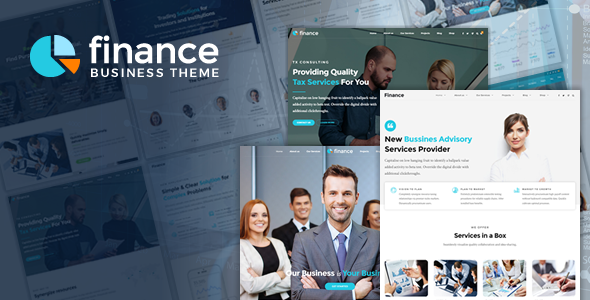 Finance is an exceptionally powerful, flexible, modern, pristine, and polished WordPress theme ideal for consulting and finance websites. It is very well structure, responsive, and will highlight your most important aspects of your business. With Finance, creating a website has never been easier thanks to its option to import the demo content and select one of the already pre-built homepage demos. You can also customize the theme by changing the header and footer layout, use the module variations, and add shortcodes. 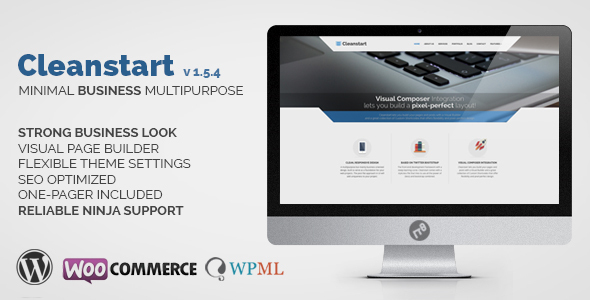 In addition, it comes packed with Visual Composer and slider revolution. Specular is an appealing, versatile, intuitive, polished, and highly customizable financial company WordPress theme. It is an awesome tool and solution for websites in almost any niche, field, and industry. Specular is responsive and will look amazing on all devices, browsers, and screen sizes. It also saves you a lot of time because of its impressive features, detailed documentation, and dedicated support team. 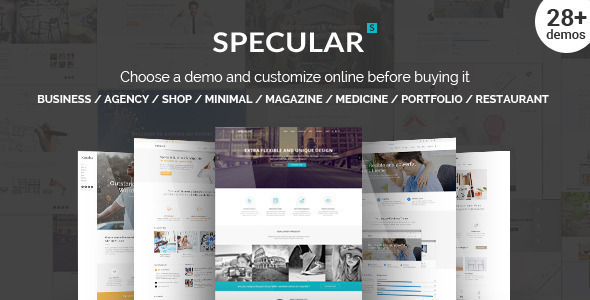 Specular has 24 stunning demos, an online template builder, advanced theme options, sliding creative blog, codeless slider, Visual Composer, back-up option, side navigation, and unlimited header designs. Reach for the stars with Specular! 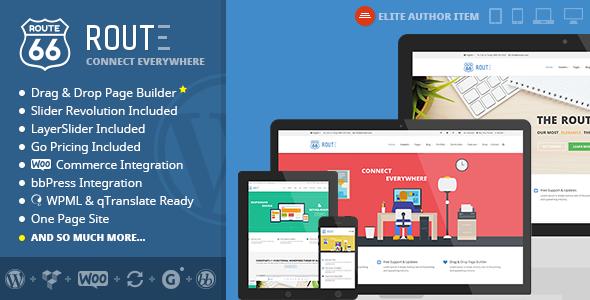 UniTheme is an attractive, reliable, professional, clean, visually stunning, responsive WordPress theme. This theme is one of the best platforms for finance related businesses and websites because it does not require coding knowledge to achieve great results. 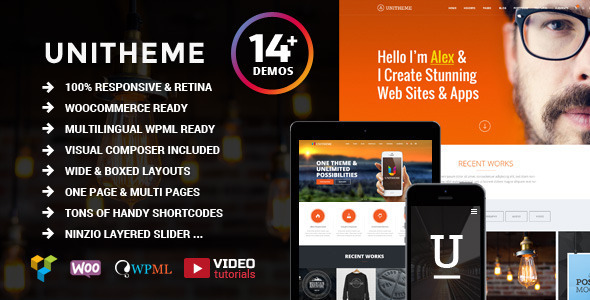 UniTheme incorporates more than 14 uniquely crafted demos, Visual Composer, several theme layouts, multiple header and navigation styles, a flexible admin panel, portfolio and blog layouts, supports WooCommerce, 45+ powerful shortcodes, and an awesome slider. Bring your content and UniTheme will take care of the rest. 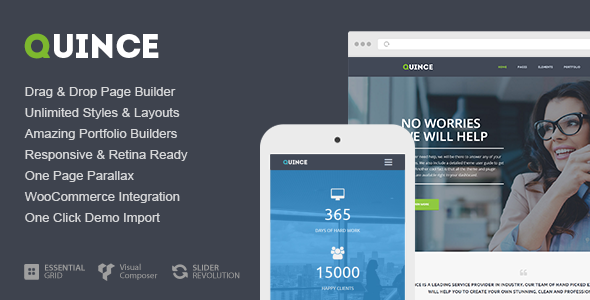 Quince is a crafty, clever, gorgeous, simple, and highly responsive WordPress theme. It comes packed with a page builder that allows you to create unlimited styles and layouts to best showcase your work. Quince packs an intuitive theme admin panel, one click demo setup, SEO optimized code, WooCommerce support, RTL support, 600 fonts, Slider Revolution, Essential Grid, and multiple pre-built page layouts. Not only is Quince fully responsive, but it is also retina ready and cross browser compatible. Check it out! 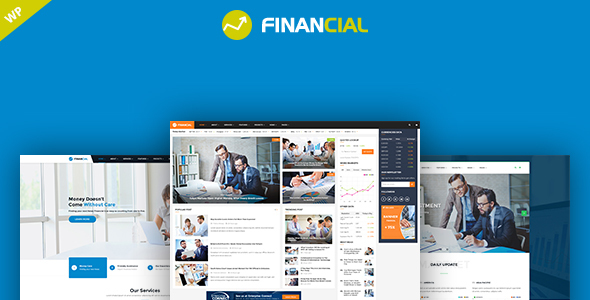 Finance is a professional, perfect, robust, reliable, and attractive WordPress theme for financial services. No matter how big or small your financial company is you will have a lot to gain from using Finance. With this theme you will be able to add your content easily to one of the pre-built homepages, craft different header and footer layouts, change the typography and colors, embed Google charts, use the integrated page builder, translate it in any language, or sell products and services. Finance is highly customizable and affordable. 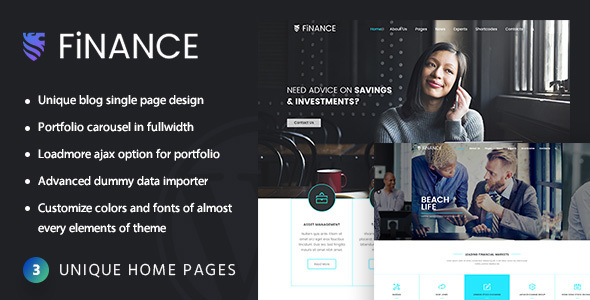 Finance + is a one of kind, stunning, elegant, up to date, flexible, and efficient premium WordPress theme. This is an impressive theme carefully designed to be suitable to financial related companies and businesses. Full of features, Finance + takes the cake when it comes to personalization. No matter your skill level, you can create something unique and elegant with Finance +. This theme comes packed with 25 inner page layouts, 5 homepage demos, different footer and header layouts, a couple of premium plugins included, and compatibility with popular plugins. Route is a theme you can have fun with. It is packed with user friendly theme features and tools you can use to craft stunning websites for finance businesses. This theme’s responsive design will scale perfectly to fit any device used as well as any browser. If you are looking to design unique page layout, you can use the premium plugin that comes bundled with this theme: visual composer. Some of Route’s features are the parallax effect, 2 slider plugins, Go pricing, retina ready, one page setup, unlimited color pallet, video background, and the child theme. Regardless of your content, Route will enhance and highlight it. Cleanstart is a modern, professional, excellent, outstanding, reliable, and easy to business multipurpose WordPress theme. Cleanstart is well documented, fully responsive, and can fit any purpose. It has an integrated drag and drop page builder with custom shortcodes and page elements, unlimited color options and background choices, MailChimp integration, Twitter feed, a full responsive design, parallex effect, beautiful portfolio, before and after option, and an enhanced header panel. With this theme you can do anything you put your mind to, without having to hire developers. If your goal is to develop a successful website for your financial company then Zeyn is the theme for you. This premium WordPress theme is highly intuitive, attractive, stylish, eye-catching, and vastly customizable. 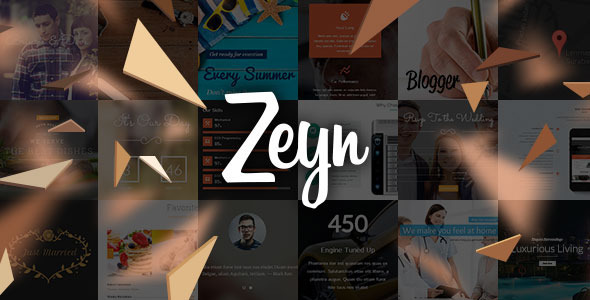 Zeyn offers you an exceptional amount of features you can use to create a limitless number of layouts. You have several homepage demos and landing pages, visual composer, layout and navigation styles, demo installer, header styles, slider revolution, and a few more. This theme is easy to navigate and anyone will enjoy using it. 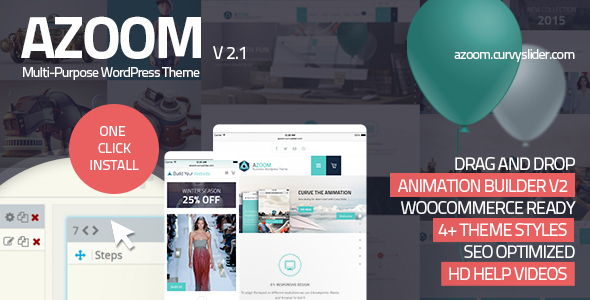 Azoom is a highly responsive and customizable theme mostly oriented towards businesses and companies. It comes with a powerful drag and drop animation builder capable of crafting unique and professional layouts. Whatever your vision, with Azoom you can make it come to life. It includes a beautiful slider, dozens of design elements, rock form builder, special grids, video background, parallax effect, WooCommerce ready, various header styles, and much more. Rise above your competition with Azoom! Thine is a versatile business and corporate WordPress theme. It combines modern and simple elements to create a beautiful design that will adapt to all businesses and companies. Thine has page header images or videos, a responsive design, WPML support, live customizer, custom sidebars, tons of shortcodes, and an impressive documentation. With Thine you will have a clean and professional website that will not overbear your audience and clients with unnecessary design elements or information. This is a theme worthy of your favorite list. Corpress will exceed your expectation in all the ways that count: design and functionality. It is a fast loading theme, easy to install, and even easier to customize and brand. Corpress comes packed with 12 homepages, 2 potent premium plugins for free, unlimited header options, swipe menu, different menu styles, font awesome icons, lightbox preview, parallex effect, and live Twitter. This is an impressive product I wholeheartedly recommend. It’s not hard to believe why Converio has an almost perfect rating. The abundant amount of features this theme has it is truly impressive. 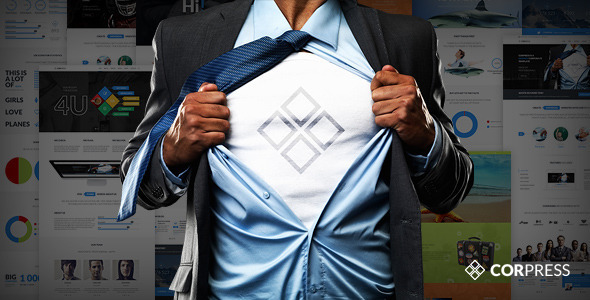 Converio uses only the best SEO and UX practices in order to give the theme’s user a better chance of being higher ranked. 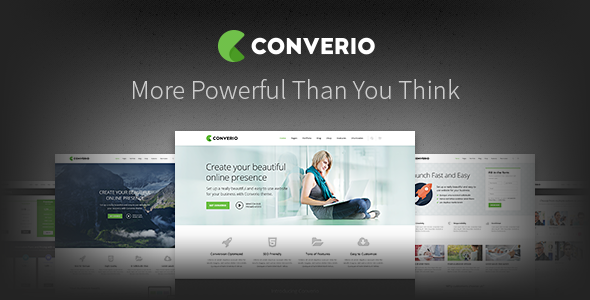 Moreover, Converio also has tons of pages available for customization, a powerful set of shortcodes, mega menu, live customizer, a fully responsive layout, 2 converio sliders, events plugin, and slider revolution. This theme is incredibly easy to use and will keep your visitors coming back. Shore is suited for companies that care about professionalism and quality. It comes fully packed with features, a responsive and cross-browser compatible design, and a clean and modern design. Those who choose Shore will benefit from amazing features such as 8 pre-built demos, Visual Composer page builder, WooCommerce integration, a beautiful premium slider, stunning portfolios, smart admin panel based on Redux Framework, svg icons, rich typography, and other options to challenge your creativity. Premium WordPress themes require minimal effort from you to setup and customize this is why most people prefer them. All of the themes in here will boost and elevate your business which makes them the best financial company WordPress themes for financial services and consulting businesses.